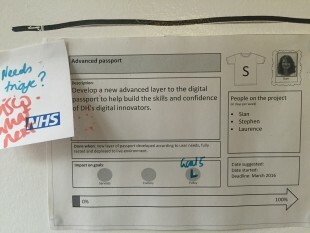 My first job when I turned up in the DH Digital team was to review how we decide what to do next. I’m working in the strategy team, which means that alongside the work I do on raising capability within the department, I also programme manage our work across the whole of the digital team to shape the direction of where we’re going. When I arrived, there were lots of documents explaining what we do, but it took me a good week of reading to get my head around it. an update to our digital strategy, which publicly promised to deliver work under 5 key themes of openness, simplicity, evidence, mainstreaming and efficiency. a busy team, working hard on lots of important projects, being busy with ‘BAU’, and people in different bits of the team picking things up left, right and centre. Despite all of the documents and all of the busy-ness, it was difficult for me as a new arrival to work out exactly what we were busy ‘about’, and what we were busy ‘for’. So it felt like we needed to move from lists of objectives, ambitions and manifestos, into some a more tangible roadmap to show where we’re going. My first task was to look at how we triage new projects, and communicate what we’re doing both within the team and to our stakeholders. 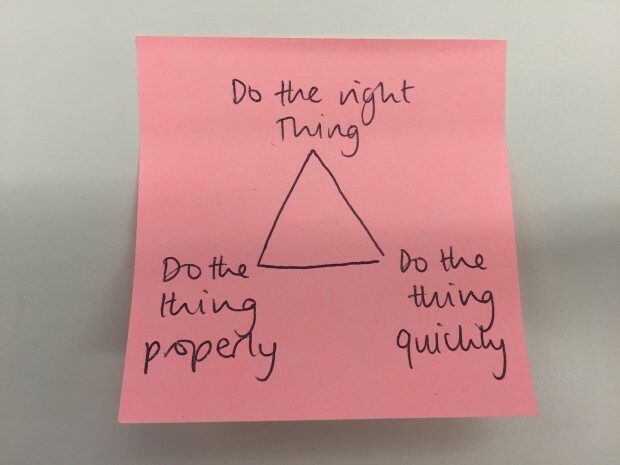 We need a triage process because of this conundrum: it’s difficult to do the right thing, do it quickly, and do it properly. It’s easy to compromise one element- but you end up with the wrong product, a poorly built product, or a product that’s never delivered because it took too long. Crucially, this should help us adopt a more agile way of working - as a whole team, rather than 30-odd busy individuals working on competing priorities. By working together, we should be able to prioritise and plan more effectively, so that we get the right things done more quickly, and get early feedback to make sure that each project we deliver is top quality. What is the overarching context for what we’re doing? Who are the users of our programme wall? What are the needs of the different users of the wall? What would a successful prototype deliver? I worked really closely with Lisa, who’s recently joined the team from GDS. 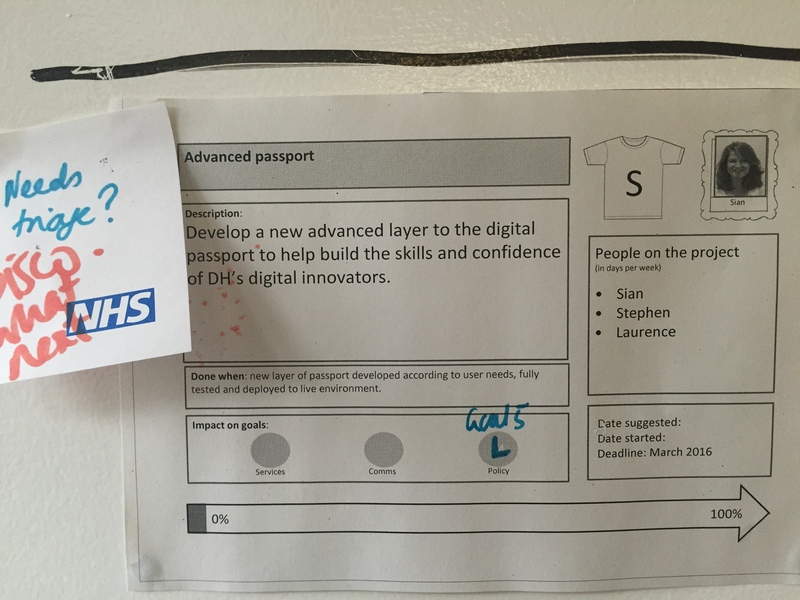 Together we worked out where our ambition of digitally transforming the health and care system fit into the overarching DH purpose of helping people live better for longer. We recognised that the purpose of the wall is to enable us as a team to start the right things first, and focus on them, to ensure that we do them properly- sorting out the triangle conundrum above. 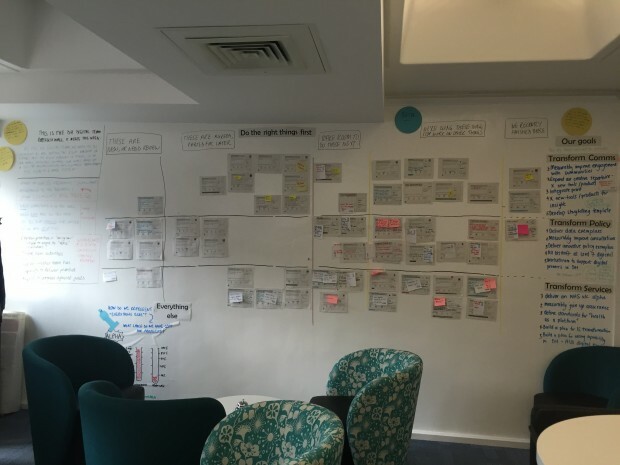 A successful wall would enable us to discuss new work as it came in, prioritise what we were doing, and allocate specific skillsets and time available in the team to the projects that help us make the most progress towards achieving our objectives. It would also cause a shift in the way that we’re working- from being a team of individuals to a team that can collaborate effectively to get the right things done first. We mapped out our users, and discussed their needs. 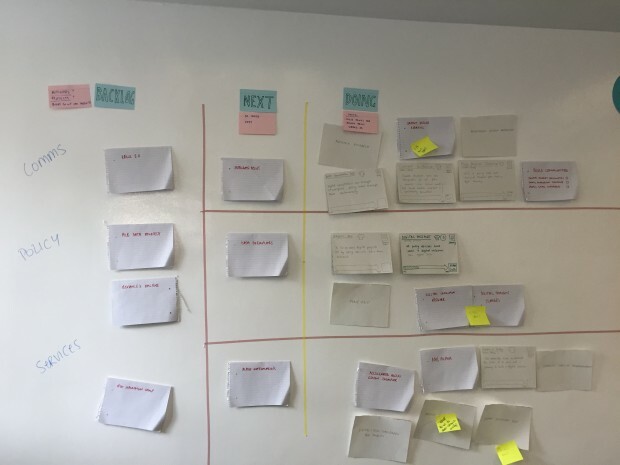 I ran a language analysis session with our engagement lead and head of strategy to understand how they naturally prioritised work in the team when they were put under pressure. This helped us to identify the criteria for prioritising one project over another- being the size and impact of the projects, where they contributed to multiple objectives, and where they really helped us to ‘transform’ something (although we did have some trouble with that word ‘transform’- as we’re still grappling with what we want to transform things into). 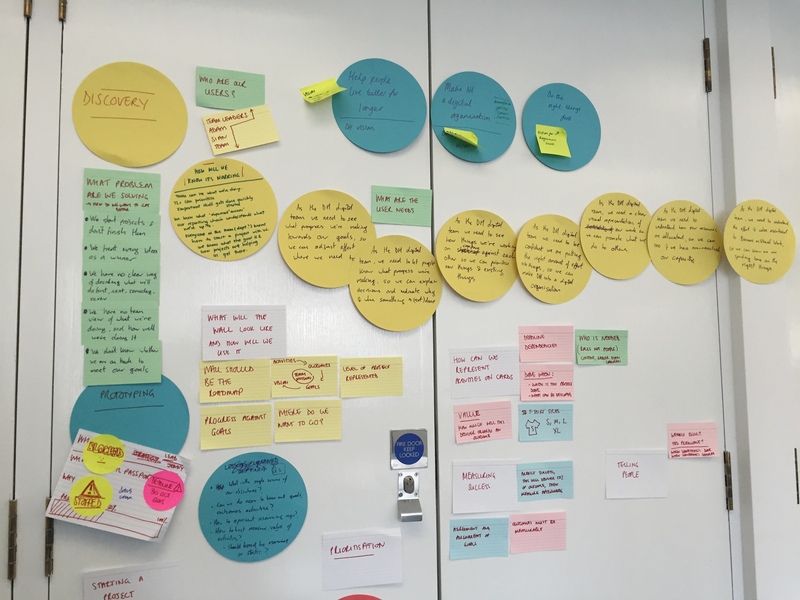 This in turn helped us to build a prototype ‘card’ for the wall, to represent projects as they move through their journey from proposal to done. We spent quite a while discussing how to present the projects, and finally agreed to split the projects into ‘transforming comms’, ‘transforming policy’ and ‘transforming services’- in line with the team objectives document. We set out a prototype process for suggesting ideas, scheduling them, reporting progress and communicating completed projects. And the alpha was born. Over the next few weeks, we began to iterate. The cards on the wall evolved- from a hand drawn folded template, to a single-sided digital version. 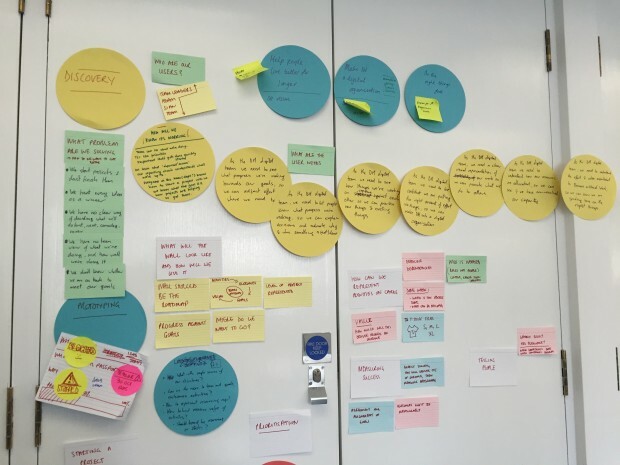 We ran sessions with individual team leads to understand their projects and see how the wall could better meet their needs- we learnt by doing. We moved the boundary lines around- so the ‘backlog’ became much bigger, ‘next’ could only hold 4 cards per objective, and ‘doing’ became strictly things we were working on this week. We piloted whole-team show and tells around the wall, to share our successes- and learnt how to keep those sessions to time! 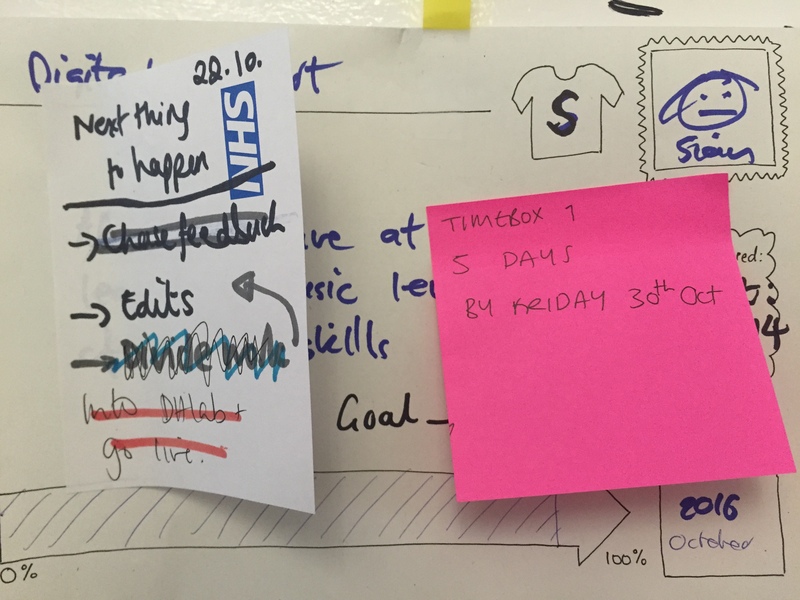 We held team-level discussions to focus our energy on priority projects, and push things on by timeboxing them. We had conversations about what BAU means, and how to represent it. And we got to Beta. 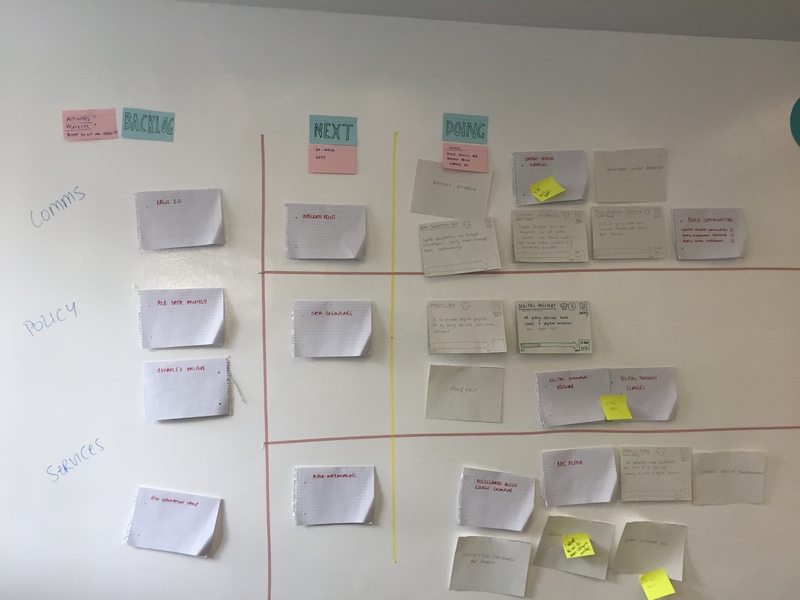 We’re continuing to use and improve the wall, and writing this blog is an action from our last triage/wall meeting, where we discussed what we need to do to celebrate what we’ve done! We’re still getting used to the wall but it’s certainly becoming more and more helpful. The first card (which was a prototype) is complete- hooray! Change takes time- and people need to see and feel it working to buy in. Having something physical really helps with that seeing and feeling. Writing things down makes you do them- and helps other people help you. Showing and telling works- we’ve already identified crunch points where people were needed for two things at once, and avoided problems growing by talking about our current projects regularly and openly. Understanding user needs is crucial- and continual feedback really helps to make things better, because it’s very difficult to get everything right first time. This goes for the wall, and for individual projects too. Timeboxing something (putting a carefully selected mini-team to work on it for a week, and getting it finished) is really rewarding. The product is better, and it gets done more quickly. And as long as we’ve made sure it’s the right thing to do through the initial triage process, we’ve beaten the triangle- hooray! I need to blog more regularly- sorry this is such a long post! Love it Sian and Lisa, a joined-up thinking approach that will really pay dividends. It would be easy to be critical of the inherited situation, but let's not dwell on that, provided it no longer exists! What you have described is a strategic process that has been hotly debated in the strategic management literature for two decades, yet evolution is infinitely wise. Not only have you implemented process innovation, you have also made people deliver more happily and saved hard working taxpayer money. Well done...the challenge now is to continue to build momentum and to think even more strategically by redefining the boundaries of what you have created. DOING THE RIGHT THINGS RIGHT was my take on delivering meaningful outcomes. What are the RIGHT things to focus on (in itself not an easy process), implement them in a way that maximises identified benefits, measure outcomes to ensure the expected result(s) has (have) been realised. Finally learn from mistakes! MONITOR achievement against percentage complete indicators over time to determine progress. I wish I'd been aware of this when confronted with Best Value Service Reviews but I wasn't! However I'm pleased to say that DEE is being used now to measure performance in the area of reducing the appalling levels of global road deaths. hi John Stuchbery, what you have of course described is "doing things right" and benchmarking is an important part of this process. Glad to hear that this is working for you. This is quite different from "doing the right things", which is a strategic approach that requires both system-led and metacapabilities knowledge and thinking. In the case of road deaths, the strategic envelope would also include designing and building infrastructure for people, not just automobiles so that one outcome would be less road deaths. The first action is to pause from doing something already in progress. If it is important and required there will come a 'squeak'. If no 'squeak' then who is watching the item under discussion. This does not mean delete, simply pause and wait. When in the Civil Service I worked under the system of three prongs to measure tasks. A six week schedule of work; what is required in the next six weeks? How much material do I have for each task allocated inside that six week window. How complicated is the item to complete. Working to these three prongs I could allocate a schedule for each task allocated to me over a six week period. I could split my email into categories, one for each week. I would then filter the emails in relation to their placement. This tasking system allowed to work on set tasks over a six period and to establish a rota of completion within the time allocated. Work that would go past the six period was not ignored but allocated a time slot in which work could be undertaken on a task which would fall in the next cycle of activity. I hope this makes sense and helps. I've shared this blog round some of the programmers in my office. NHS we need a new direction a new model. If we don't turn around the present outdated systems then the NHS will be unaffordable to people and state...CRY FOR CHANGE....NEW DIRECTION...NOW!!! This is great Sian, a fab post - thanks for sharing.